It's easy to expect a large computer to have the prowess needed to run, say, Dragon Age: Inquisition in 4K image quality. It's cooler to be able to cram all the needed resources in a fraction of the size though. Sure, some may disagree, saying that a large, full tower or at least a mid-tower case is the most appropriate container for such power. Especially since high-end motherboards usually come in the full ATX form factor anyway. Every once in a while, though, someone will launch a micro-ATX gaming motherboard. Even mini-ITX models have been revealed with borderline gaming capabilities, but those aren't our focus today. 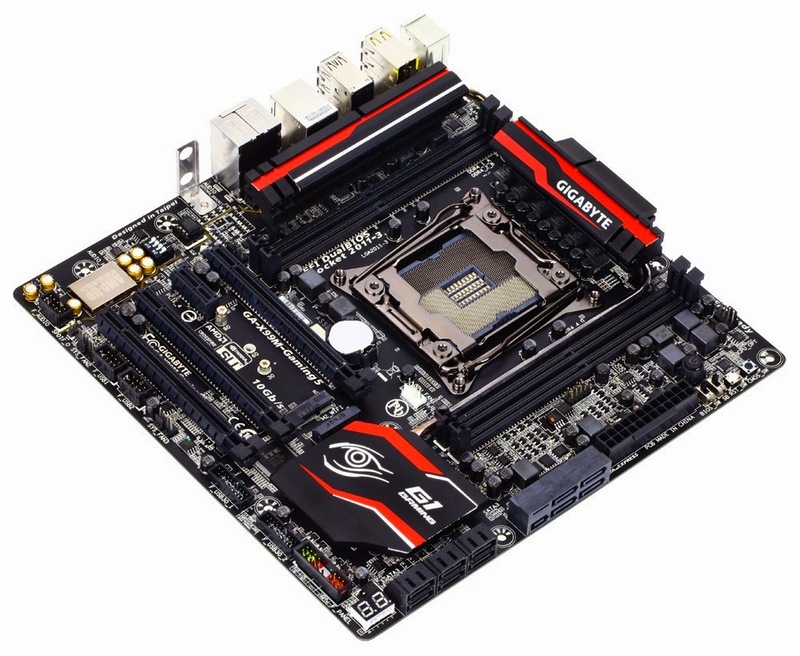 Instead, we're bringing you the X99M-Gaming 5 mainboard from Gigabyte, based on (obviously) the X99 chipset. First off, the X99 chipset means that the LGA 2011-3 socket is available, supporting Core i7 Extreme Edition (Haswell-E) processors from Intel. Moreover, the X99 chipset has support for DDR4 memory. No other chipset, not from Intel and not from AMD, has this feature. Sure, the top capacity will be limited to 32 GB for now, since there are only 4 slots, but it's not like anyone really needs more than 8 GB anyway. In fact, even the most demanding games can make do with 8 GB of DDR3 easily, let alone DDR4. Even Dragon Age: Inquisition is supposed to run fine on 4 GB of DDR3 from what we understand, so long as you have a good enough video board. 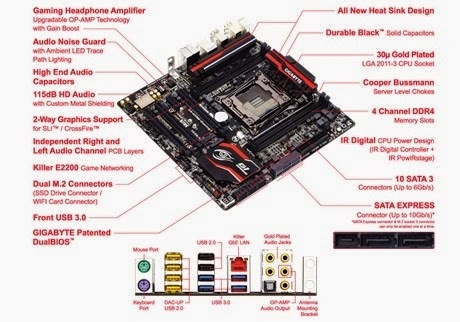 Besides the chipset, CPU and what they inevitably bring with them, the Gigabyte X99M-Gaming 5 motherboard possesses 2-way graphics support (for AMD CrossFire and NVIDIA SLI setups), as well as AMP-UP Audio Technology (enhances the natural quality of the gold-plated, 7.1 channel tech), an OP-AMP socket (you can swap the onboard audio amplifier), Killer E2200 networking, server-level chokes, and black solid caps (for endurance). Add to that onboard SATA-Express and M.2 ports and you have top storage speed as well. 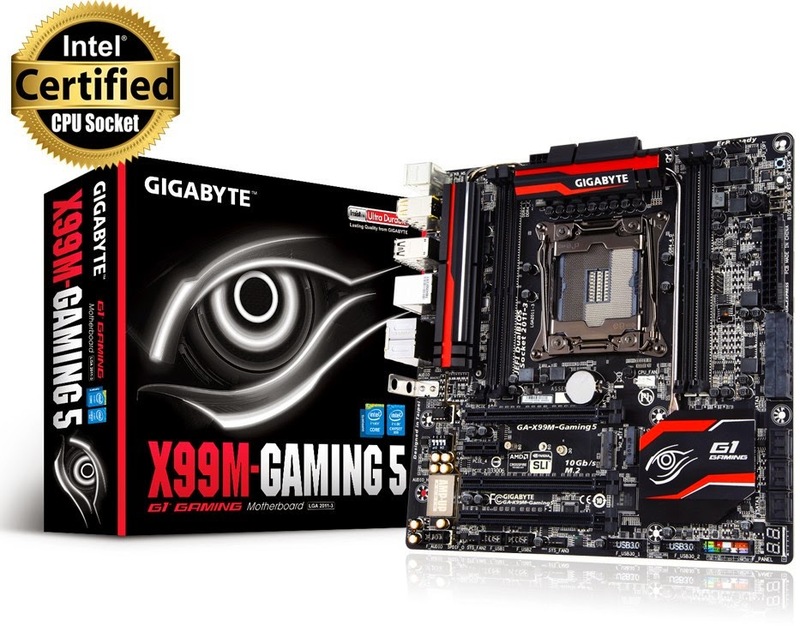 All in all, the Gigabyte X99M-Gaming 5 motherboard has everything a high-end gaming system needs and then some. Sadly, the company didn't include this information in the press release, and the product page for the Gigabyte X99M-Gaming 5 motherboard isn't much better. Given the time of the year and the oncoming winter holidays, however, we're willing to bet that it won't take more than a few days for retailers to add the product to their stock lists. GIGABYTE TECHNOLOGY Co. Ltd., a leading manufacturer of motherboards and graphics cards announced today the new X99M-Gaming 5, a mATX addition to its X99 lineup based on the Intel X99 chipset with support for the new Intel Core i7 Extreme Edition (Haswell-E) processor and latest DDR4 memory support. GIGABYTE Gaming motherboards are equipped with the GIGABYTE exclusive AMP-UP Audio Technology, which provides the industry's highest level of onboard audio features and technologies. With GIGABYTE AMP-UP Audio, gamers and audiophiles are able to experience crisp, ultra realistic sound effects while gaming, and the richest possible sound experience when listening to their favorite music and movies. 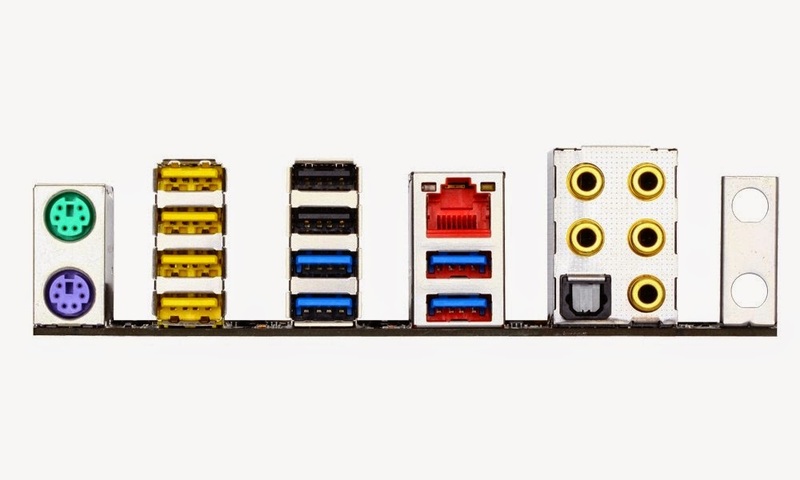 For improved connectivity and long lasting durability of some of the most vulnerable I/O, the X99M-Gaming 5 pack top quality gold plated audio connectors. Gold has superb signal conductivity and will not tarnish over extended periods of use. 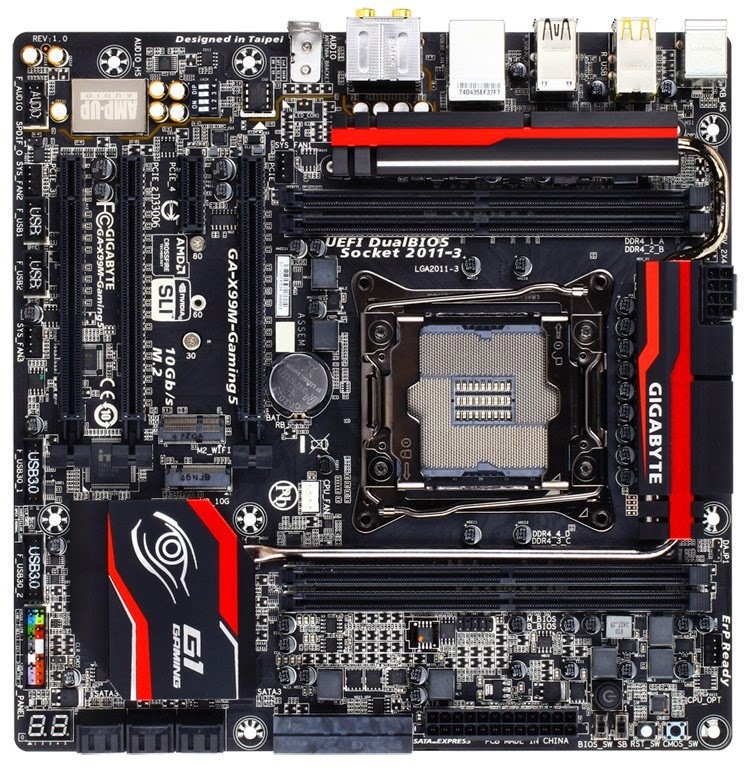 The GIGABYTE X99M-Gaming 5 motherboard features the Killer E2200 from Qualcomm Atheros, a high-performance, adaptive gigabit Ethernet controller that offers better online gaming and online media performance compared to standard solutions. The Killer E2200 features Advanced Stream Detect technology, which identifies and prioritizes all network traffic to ensure important applications that require high-speed connectivity are prioritized over less important traffic. GIGABYTE X99 motherboards use an all digital CPU power design from International Rectifier which includes both digital 4th Generation digital PWM Controller and industry-leading 3rd Generation PowIRstage controllers. These 100% digital controllers offer incredible precision in delivering power to the motherboard's most power-hungry and energy-sensitive components, allowing enthusiasts to get the absolute maximum performance from their next generation Intel Core i7 Extreme processors.